Four New free crochet patterns each month. Delivered twice a month. The following pattern is my original design. Please only copy or print this pattern for personal use. Please contact me if you find any errors. 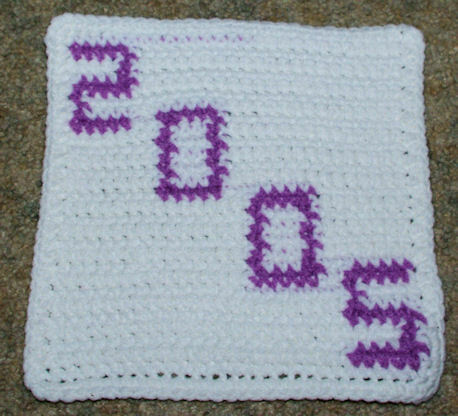 Stitches: ch, sc, sl st.
Pattern specifies how many single crochet stitches to work for each color. R2: Ch1, turn. 22MC, 5CC, 1MC. R3: Ch1, turn. 1MC, 1CC, 26MC. R4: Ch1, turn. 26MC, 1CC, 1MC. R5: Ch1, turn. 1MC, 5CC, 22MC. R6: Ch1, turn. 22MC, 1CC, 5MC. R7: Ch1, turn. 5MC, 1CC, 22MC. R8: Ch1, turn. 15MC, 5CC, 2MC, 5CC, 1MC. R9: Ch1, turn. 8MC, 1CC, 3MC, 1CC, 15MC. R10: Ch1, turn. 15MC, 1CC, 3MC, 1CC, 8MC. R11: Ch1, turn. 8MC, 1CC, 3MC, 1CC, 15MC. R12: Ch1, turn. 15MC, 1CC, 3MC, 1CC, 8MC. R13: Ch1, turn. 8MC, 1CC, 3MC, 1CC, 15MC. R14: Ch1, turn. 15MC, 5CC, 8MC. R15: Ch1, turn. 15MC, 5CC, 8MC. R16: Ch1, turn. 8MC, 1CC, 3MC, 1CC, 15MC. R17: Ch1, turn. 15MC, 1CC, 3MC, 1CC, 8MC. R18: Ch1, turn. 8MC, 1CC, 3MC, 1CC, 15MC. R19: Ch1, turn. 15MC, 1CC, 3MC, 1CC, 8MC. R20: Ch1, turn. 8MC, 1CC, 3MC, 1CC, 15MC. R21: Ch1, turn. 15MC, 5CC, 2MC, 5CC, 1MC. R22: Ch1, turn. 1MC, 1CC, 26MC. R23: Ch1, turn. 26MC, 1CC, 1MC. R24: Ch1, turn. 1MC, 5CC, 22MC. R25: Ch1, turn. 22MC, 1CC, 5MC. R26: Ch1, turn. 5MC, 1CC, 22MC. R27: Ch1, turn. 22MC, 5CC, 1MC. BORDER: With MC, Ch1, turn. Sc in ea sc and in ea row end, placing 3sc in ea corner. Please email me for information on stitches that are not included on that page.